Many things can cause sore throats, and tonsillitis is one of them. Your tonsils are areas of lymph tissue – special tissue that helps you to fight infection – at the back of your mouth. 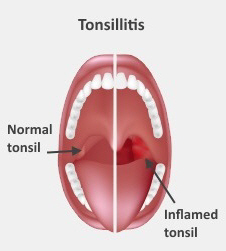 Sometimes tonsillitis is caused by a streptococcal infection, and can lead to rheumatic fever. If you belong to one of the at-risk groups get a doctor to check your throat straight away. If repeated bouts of tonsillitis mean you have to take a lot of time off work, or your child has to take a lot of time off school, a short operation to take the tonsils out may help. This is called a tonsillectomy, and happens under general anaesthetic. Even when your tonsils are removed you will still have plenty of lymph tissue to fight infection with. Having your tonsils out is a short operation, it usually takes less than an hour. You, or your child, are likely to go home on the same day as the surgery, but you may need to stay the night. or three bouts a year in the past three years. If you don't qualify for a publicly funded operation but still feel repeated tonsillitis is badly affecting your life, you might wish to have a tonsillectomy done by a private ear, nose and throat specialist (also called an otolaryngologist). It is common to have a sore throat after your tonsils are taken out. Taking regular painkillers such as paracetamol can help, but make sure you follow your doctor's instructions on how much to take. This is particularly important for children. Do not take aspirin as this can make you bleed more. If your doctor prescribes antibiotics, make sure you take them all and don't have any left over. Straight after your operation you may have a few specks of blood in your mouth, which is normal. However, if you have any more bleeding you should see a doctor quickly. If you get heavy bleeding after you have gone home, go straight to your GP or emergency department. You might also vomit dark red (old) blood once or twice in the first day. You don't need to worry about this. But if it happens more often, make sure you see a doctor. You might also get an ear ache. This is usually caused by your sore throat, and usually doesn't mean you have an ear infection. But if you get a high temperature, you need to see your doctor. Try to start eating normally as soon as you can after you have had your tonsils out. It can help if you take paracetamol 30 minutes before you eat something. Also make sure you drink enough, especially if you are not eating much. Sucking on ice cubes can help make sure you get enough water, and also help to soothe your throat. After having your tonsils out you may need up to two weeks off school or work while your throat gets better. Get plenty of rest and try to avoid any heavy exercise. You might also see a white coating on the back of your throat. This usually goes away by itself in one to two weeks. Any stitches at the back of your throat could take up to two months to disappear. The risks and benefits of a tonsillectomy, and what to expect after surgery. Written by HealthInfo clinical advisers. Endorsed clinical director, Otolaryngology, Canterbury DHB. Page created December 2015.